4 But what about the apps? 7 If we build it, will they come? Convincing her to get an iPhone was almost impossible. She thought $200 for the phone was money headed straight down the toilet. To her, phones made phone calls and one was about as good as another. It took her about a month before she would try the camera, but 24 hours after that, she was posting to her “peeps” on Facebook, finding recipes on the Allrecipes.com app, and searching for a Quiznos with Google Maps. She was addicted. In the time between then and now, two important things have happened. 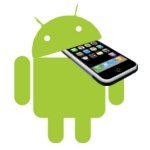 She is coming up for contract renewal, and Android has hit the market. When I discuss changing her iPhone to Android, I get an icy stare as though I had just left one of our children stranded in the Siberian tundra without food or clothing. To her, a smartphone is iPhone. Why should she change? To those of you who are not married or in a committed relationship with a non-techie, please stop reading. This does not apply to you. To the millions who have received the same death stare when you dare bring up the idea of changing phone operating systems, let me share what I have learned in helping your non-techie make the switch. Be warned, it is still not easy. “Regular folk” think of a phone the same way they see a hammer — it is a tool that helps them get a job done. When they go to the cellular store, they get a phone that does exactly what a phone is designed to do — make and receive calls. If they previously had a smartphone and used it, then they may see the possibilities of a smartphone, but still see it as a single experience probably from Apple or BlackBerry. People like my wife who think this way are not wrong. A cell phone is a tool, and a tool that works well is a beautiful thing. After I showed my wife an Android phone, her comment was, “well it looks exactly like the iPhone. Why should I change?” Same icy stare. The gauntlet has been thrown. Choosing a phone operating system is more than choosing a phone. We are at the cusp of changing our computing habits. The most important technology innovations are not on our laptops or desktops anymore, but in our pockets. Cell phones are now sporting specs equivalent to desktop computers from 2-3 years ago. Consider this — most Android “super phones” have 512 megabytes of RAM, can comfortably handle up to 32 gigabytes of storage (via microSD cards), and have a 1 gigahertz processor. The minimum specs for a computer to run Windows Vista are 256 megabytes of RAM, 20 gigabytes of storage and at least an 800 megahertz processor. Despite the fact that these phones make calls, these are not phones. These are computers, but they are not PCs. Well that would not impress my wife. So today’s phones are more powerful. Gotcha. Now, why does this make any difference to me? I like my iPhone, thank you very much, and you still have not said a thing about why this matters. Choosing which piece of hardware does not make much difference. If you take a picture with a point and shoot camera or a high end Nikon SLR, it does not make a big difference if you got the picture you wanted. Likewise it makes no difference if you write the Great American novel on a high end Sony Vaio or barely running Commodore 64. They both are tools that can produce something you want, and when you are done with them, they can be thrown away. In the end, the product is here and how it was produced is irrelevant. Likewise, if you are using a phone primarily for phone calls or texting, then it makes practically no difference what you use. No one will be able to tell what phone you are using while in a call or writing a text. The phone is a tool and is irrelevant once you have done what you want with it. The point is we are not using our phones primarily for phone calls and texting. Likewise, while we do produce things from our phones (like photos, videos, Facebook posts, etc. ), the production of stuff is not the only thing we are doing, either. The phone, more than any other device, is becoming the thing that documents our history, makes sense of our surroundings, entertains us while we are bored, keeps us updated on our friends whereabouts, connects us to our important documents, and allows us to seamlessly communicate all that information to others instantaneously. It is our gateway not just to the World Wide Web, but also to our personal web. In other words, our phones have our important stuff. Don't believe me? My mother-in-law last week went into the office supply store to get an address book. When was the last time you heard someone doing that? By the way, they had one — but just one. The world has not stopped using address books, they just have them on their phones now. Our phones allow us to produce, consume, store, organize, contextualize and communicate stuff more elegantly than any other single device. I do not deny that Apple makes great hardware (probably the best in the business, even in light of the iPhone 4 antenna issues). For that matter, BlackBerry does, too. I also would not deny that other vendors make a great OS. You can have an awesome experience on any number of smartphone platforms, specifically the iPhone’s iOS. But the Apple (and BlackBerry) experience reminds me a lot of a Vegas casino. There are lights, excitement, and magic, but there is no clearly marked exit when you want to leave. The more we live with our phones, the more stuff it begins to acquire. My address book now has over 900 names in it. Most of them are people I do not contact regularly, but when I need a number, my address book is now the first place I look because it is probably there. When I switch phones, I do not want to type in 900 names again. If I switch from an iPhone to another iPhone, it is no big deal. Apple’s iTunes takes care of it seamlessly. But what if I want to go from an iPhone to a BlackBerry? It is definitely doable, but it is not intuitive. It is easiest if I sync to Microsoft Outlook, and then get BlackBerry to sync with that, but that is hardly seamless. It means I have to use three programs (iTunes, Outlook and BlackBerry Desktop). While those of us who are techies easily see how to do the conversion, remember that you are dealing with non-techies and this scenario sounds like a nightmare. Apple wants me to stay in the Apple ecosystem to be easy. In iPhone, it is easy to import almost anything, but exporting is tricky. Once I try to incorporate something that did not come from the halls of Cupertino, things get complicated. In Android, it is easy to export data as well as import it, and much of it can be done in the cloud. The big caveat is you must have a Gmail account. Once you have that, almost everything else follows. On your Android phone you can easily import your Gmail contacts — they are loaded wirelessly as soon as you put in your Gmail account address. The iPhone can also import Gmail contacts easily, but what if you wanted a spreadsheet of your contacts? What if you wanted vCards? What if you only wanted to export your work friends? Just your family? What if you wanted to export your high school friends to Outlook? Contacts are not the only thing you can export easily. What if you wanted to export your Google Docs to PDFs? To Word files? To RTF? All of this is done easily with Gmail or Google Docs. What if you change cell phone providers and lose your old telephone number? Google Voice has you covered. Likewise, your new phone on your new carrier can have all your stuff quickly whether or not it is from Android. By design, your life on Android can be imported and exported easily. If you decide that your true love is iPhone, you can take your Gmail, contacts, documents, etc. to Apple and live happily ever after. If you have a spat, though, an iPhone divorce can get messy with information being split down the middle depending on how Apple defines data custody. But what about the apps? Ah, but many a marriage would stay together for the sake of the app children. Apple has the lion’s share of apps, but that is a race that is still being run by Android, BlackBerry, Symbian, etc. That said, many apps are tools. For example, Jotnot is an iPhone app that allows you to use the camera as a pretty good document scanner. Its functionality is duplicated by several other iPhone apps such as ScannerPro and DocScanner. Likewise, there are several Android apps that do the same as well, such as Droid Scan 2, or the Android version of DocScanner. But once you have the document, what parts (apps, websites, etc.) of the phone can actually use it is key. Can you use that document with several apps on your phone? Well, with great tools like Evernote, Dropbox, and Google Documents, the answer is yes. All of these tools are cross platform with apps available on Android. In iOS you usually have one option for a data file, and that is usually the app that created the data file. While apps are great, most tool functionality is available in another form on Android. There are notable exceptions, but for the most part the functionality of many apps can be replicated across several platforms. I am not sure if my wife is convinced. Knowing my wife, she still sees the dollar signs for another phone and wonders why we should shell out more cash for a device that will do essentially what she has now. She just got the iPhone the way she wants it, and she also knows that going to another OS will require another learning curve. She is not wrong. Jumping ship from one OS to another will cost cash, and for a family with four kids, that is not a decision to take lightly. First of all, as all computer owners know, while the hardware may not soon wear out, its functionality will. Older computers will not run newer OS updates. Companies will not maintain old OSes long. Further newer OSes give greater value, so there is a strong case to be made for upgrading. You do not have to ride the bleeding edge, but there is a definite disadvantage to trailing an end of life technology. In other words, there is a time to let go of technology, even if you like it. But my main argument is that our phones are not just phones anymore. They are the most personal piece of technology we own. Most people would not dream of leaving the house without their phones. Why? Because our phones and their accompanying operating systems are becoming less accessories and more personal histories. Sure, our phones know who we know and keep us in touch with our environments, but more importantly they record our conversations and know where we have been. When we want to know what someone said, we can look up their e-mail/Facebook post/SMS. The longer we stay with one operating system, the further back our phones can take us. We will be able to look up SMS messages from 2003, and thanks to good search options, we will be able to find it. We will be able to search our e-mails quickly. Every phone OS comes with a learning curve, and depending on which smartphone OS you choose, the more likely you are to stick with it. That little piece of muscle memory keeps people stuck on several technologies from the innovative to the truly vapid. So if you choose an iPhone, you are likely to stick with an iPhone and never think about jumping ship because your history is on an iPhone. In the meantime it begins to collect all your "stuff" investing you deeper and deeper into the platform. So which OS you choose matters because it is what you get used to. That would be fine if it did not also entail an important philosophical issue as well. The OS that you own will dictate how you access information, make sense of it, and communicate it. Further, that OS will say something about your own philosophy. I do not mean to make this solely about Apple, but as the big kid in the playground it is hard not to. Steve Jobs has a beautiful vision for the smartphone. It is revolutionary, magical, and largely under his control. “You can check out any time you like, but you can ever leave.” That is the way many successful businesses run. BlackBerry has a similar vision, just more phone choices. Android is inherently different. Android is not a perfect experience, but the exits are well marked, and mean that you can take the data from one app to another (i.e. you can open Google Documents in several applications), you can access much of it on the web, or you can exit the platform altogether and take all your data with you. The philosophy is an open platform as opposed to a closed one. That comes with advantages and disadvantages, but for my money, if you must change phones from time to time (and you will), and you want to have more choices, it makes sense to already be invested in a platform that allows you the flexibility of many choices in hardware and data manipulation than in a singular vision that has few choices, no matter how beautiful it is. "Yeah, but I just want a phone. You're over thinking this. I'll only have this phone for a year or two then I'll switch." The children are no longer in Siberia, but my wife now thinks this is a lot of text for a simple decision. Then let me go to the bottom line. You can save cash with Android. These arguments are all fine, but knowing how much we could save makes my wife's eyebrows raise. Depending on where you live, different service providers have different coverage areas. If you are lucky enough to have all four big names with decent coverage in your area, then you are in a great position. AT&T and Verizon have the lion's share of the market with Sprint and T-Mobile trailing. Not surprisingly AT&T and Verizon also charge the most which means Sprint and T-Mobile have to try harder to get subscribers by offering more features cheaper. For my wife and I, that means that we can get unlimited data and texting for $130 on Sprint, which would save us $50 a month. If in the future, a different carrier has a better deal, we can change carriers again, all the while keeping all of our data from one Android phone to the next. As a subscriber, you now have the power to use the competition of the market in your advantage. Very smart. My wife’s icy stare has thawed some. She does not disagree with any of my points, but she is also not wild about change. Who is? But she does like the Galaxy S screen, and the easier texting of the Epic 4G, and most importantly with the cost savings, it just might be a slam dunk. Until the end of August, we will just have to wait and see. T-Mobile G2 Launching September 29?